This one act, one man play is about a little known member of William Shakespeare’s acting companies between the years of 1592 and 1612. A Player need Jon SIncler, sometimes referred to by Shakespeare as Sinklo, was it seems a friend of the playwright, with roles in many of his plays but never a Sharer in the Company Not much is known about him but the play gives the character Jon Sincler, the chance to explain himself as he shares what he is about to do to pay tribute to his friend, William Shakespeare. 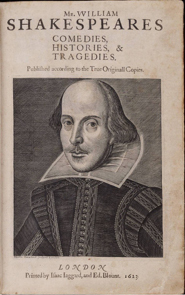 Shakespeare wrote 37 plays and 154 Sonnets, many of which are quoted in Jon Sincler; Hired Man. Told in part in Original Pronunciation the audience has a chance to hear the words and phrases much like they sounded 400 years ago as Sincler takes them through the words and ways of Shakespeare and the English theatre of the sixteenth Century. The play, written by Richards has been researched and performed onstage and in podcast form but now Friended by Shakespeare will move about the country playing galleries and spaces like the wonderful Gallery on Third in Carnegie, from Washington D.C. to New York, Los Angeles and London. “I like the idea of art galleries and spaces since many times Shakespeare’s companies performed in doors when they were invited by gentry or the Queen herself. Yes, the Globe became their home but it was in these smaller settings that Shakespeare was able to influence those who ultimately became his most staunch backers. And the intimacy of a smaller gallery over a larger theatre space is exactly suited for this very personal telling of this tale,” says Richards who is a member of Actors Equity and performs this play under an AEA contract. Our next show is at Threadbare Cider House, 1291 Spring Garden Avenue, Pittsburgh, PA 15212. The one hour play is suitable for all audiences and certainly lovers of William Shakespeare.